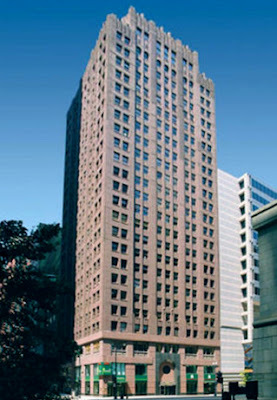 April 29, 1928 – The Chicago Daily Tribune reports that the Gage Structural Steel Company, with offices at 3123-41 South Hoyne Avenue, has set a record for placement of steel in a tall building. According to R. H. Gage, vice-president and engineer of the company, a record of 36 working days was established in the steelwork of the 100 North La Salle building. Gage says, “The first delivery of structural steel was made on Feb. 24, 1928, and the final delivery on April 13, 1928, and the erection of same was completed shortly thereafter in the record time of seven weeks, or thirty-six working days. Three days were deducted for inclement weather, when the steel erectors could not work, and Saturdays were figured as half days, owing to the fact that the steel erectors quit at noon.” [Chicago Daily Tribune, April 29, 1928] The 25-story building at the corner of La Salle Street and Washington required 1,958 tons of structural steel. 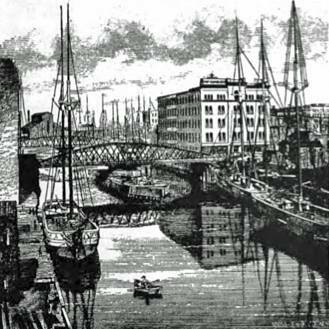 April 29, 1862 -- Report in the Chicago DailyTribune for this date: "A drunken man named Gates, who resides on Wells street, became suddenly sobered Saturday night, as follows: He was walking along the river dock between Randolph and Lake streets, when, by some means unexplained, he got into deep water. He howled lustily for help, and was rescued by two men, just as he was sinking for the last time. Never was a pickled article more suddenly or completely freshened than was Gates. He was taken in charge by the police and furnished with lodgings in the Hotel de Turtle, West Market station." Poor pickled Gates nearly met his doom just beyond the nearest bridge at Randolph Street, pictured above.